“And his other great interest was apples. He had spent much time trying to find an apple which could be grown in Southern California. He explained ll the difficulties of such an endeavor and getting good apples crops here. Now my grandfather was a Midwest grocer and my Mom a Midwest-raised apple lover ( who maintains to this day, as do I, that the best apple in existence is the Maiden Blush which was originally created around Philadelphia about 1851. If you make applesauce with MB, you only have to put 1/2 as much sugar in, they are so naturally sweet) anyway, back to apples :), , so the Old Man caught my interest. He explained how after much research, he was the first person to bring the Anna Apple to SoCal and grow apples from it. He had imported them from from Israel. 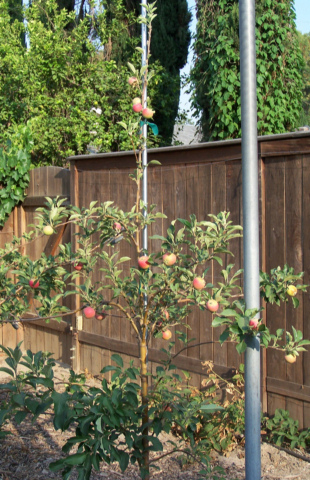 I always remembered that trivia because someday, I had planned to plant an Anna orchard in my place when we bought a house in SoCal. But now we are out here in western PA where it is too cold for Anna. The Old Man is dead now. Even the house was raised to make room for office buildings. I always wondered what became of any Anna apple trees he might have had in his backyard. Did they keep them as landscaping for the office buildings or just plow them up as “in the way”? We never saw his backyard so never knew if he had any on his property or if he had planted them somewhere else. Funny, the things we remember from so many years ago. His story is entirely probable. I’m trying to find out more of the history of the development of Anna in Israel, and will post it if I do. All the disappointment of Carolina Red June has been forgotten now that I’ve harvested Williams’ Pride. 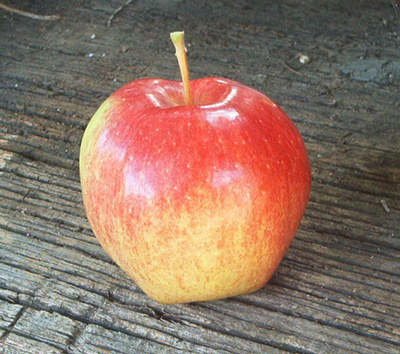 It is the perfect summer apple; firm, crisp, juicy, sweet, spicy, colorful, and keeps decently. It bears early in its lifetime, even on vigorous rootstocks, and is productive and reliable in our climate. 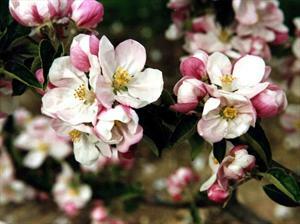 It will blossom and set fruit in 100 degree weather and color up nicely despite hot nights. Did I mention it is highly disease-resistant? We owe the folks at PRI a debt of gratitude for this one. I planted a full-size tree of it out back. The tree above is Carolina Red June, a treasured early apple for subsistence farmers in the South to replace their depleted stock of winter keepers. It was valuable as the color was good enough to market it, the flavor and texture were good for a summer apple, and it was productive, as you can see by this 2-year old tree. However, in our hot spring it never gets beyond bland and mushy. Too bad, as its really a pretty apple and fills a gap in ripening between Dorsett Golden and Hawaii. 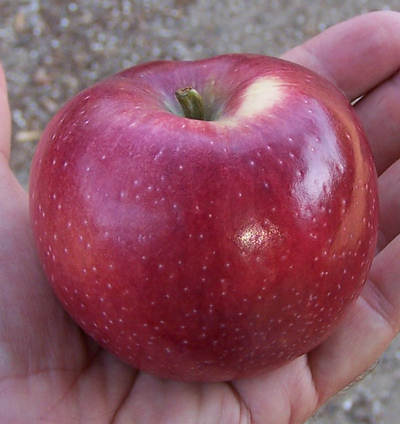 Anna, our first-ripening apple, is far superior as to taste, size, and texture. So what do I do with it? I’m afraid I have no need for a pretty, productive apple that has poor quality. I tried picking them greener, and they’re just as bad. I’m afraid I will need to graft something on to the trunk and lop the rest of the top off this winter and keep searching for a superior early apple. For the second year in a row I’m disappointed with Whitney Crab apple. It bears a nice crop of beautiful apples, but it ripens too early in our heat and is mushy and flavorless. I’ve tried picking it at all stages, really green, ripe, and over ripe, and it just has no character. It is in my tall spindle orchard which is meant for heavy production, and I have deemed it unworthy of the space. I bud-grafted a Rubinette bud onto the trunk and will lop the rest of the tree off this winter. On the other hand, American Golden Russet is showing all the hallmarks of a hot-climate champion. It has been really late to leaf out, but is now leafing out fully and setting a lot of fruit, blossoming over a couple months. Every leaf bud is opening up with very little blind wood, meaning it will be quite productive. This goes to show what may be desirable in a cold-climate commercial setting may be opposite from what is best for the home gardener in a hot climate. A commercial grower wants the tree to blossom all at once so he can time the sprays properly, and ripen all at once so he can send the pickers through one time. He wants the tree to ripen by late October, or it may get too cold to ever ripen properly. But we have waves of pests that move through that could damage the trees at different stages; in April the aphids are thick, in may something eats the blossoms (I still haven’t figured out what), in June the codling moths start to attach, and in July the grasshoppers attack the tender bark. A tree that blossoms over a long time has a much better chance of surviving these attacks as different insects attack different stages of growth. For example, if the tree hasn’t leafed out yet, the aphids can’t bother it. Since American Golden Russet is just now setting fruit, that means it will ripen in December, perfect weather here in Southern California for making top-quality apples. It will go through our worst heat in September as a juvilile, where it is able to take a great amount of blazing sun with no damage. The fact that it is a tough-skinned russet only helps it to survive. Having the harvest spread out over several weeks also means a steady supply of tree-ripened fruit. Our season is never-ending and we can pick fruit in February if need be. I’m already putting together my order for budwood of different varieties to graft into the orchard, and am leaning heavily on russets. They have shown good success here and the flavor holds up well to the heat. I can’t wait until they really start bearing, as I’m anxious to try making cider from them. Joan Morgan published my article on warm-climate apple growing in her Fruit Forum, which caters to home and commercial apple growers in England. She even translated my American into English. Joan has written a wonderful book called The New Book of Apples, and contains everything you really need to know about the fruit, including taste descriptions of 2000 varieties that she has personally eaten. Thanks Joan for your hard work and sharing it with us.